Some mobile ads you can't really complain about because they help subsidize the costs of free apps. But there are some ads that are just annoying because of the location and the timing of it. You might expect to see ads on your Android phone while playing a free game, getting search results, and on some free apps, but you wouldn't expect to be solicited while looking at your notification bar. Japanese carrier KDDI recently angered some of its customers by using the notification bar on Android devices to run push advertisements for the Au One Market. Now, it seems that T-Mobile has started using the notification bar on Android to send out ads. According to TmoNews, customers of the nation's fourth largest carrier are protesting on T-Mobile's forums and websites about ads they have received on their notification bar for the T-Mobile VIP Zone, March Madness brackets and other promotions. The ads started on T-Mobile's My Account app after it was updated, and spread to the notification bar. Since users can't opt out of the notifications or even uninstall the My Account app on models running stock OS, all that is left is to complain. Most feel that the notification bar is for personal information and that ads just do not belong on it. And there also is the waste of battery power to consider. It might not seem like much energy is being wasted, but as many Android users know, every bit of battery life adds up. 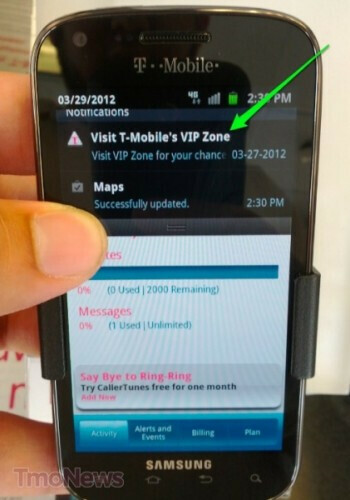 If you're a T-Mobile customer using an Android smartphone, have you received any ads on your notification bar? Let us know by dropping a comment in the box below! Its called Airpush. 'Airblocker - Airpush Block' did the trick for me. https://play.google.com/store/apps/details?id=pl.byq.airblocker&feature=search_result#?t=W251bGwsMSwyLDEsInBsLmJ5cS5haXJibG9ja2VyIl0. Airpush Detector works on unrooted phones as well. I'd leave, and it seems like Tmo is doing their best to go out of business. Sprint did this as well, but only once a month or so; it was always the same notification to see "new news" in the Sprint Zone app. Somewhat annoying, but not a killer. T-Mobile customers certainly can't be surprised by this. After all, with all the apps carriers load onto phones without any option to remove, they can't truly be shocked to see a notification about those apps periodically. It's unfortunate, but just the way of things. Root and then disable bloatware? Quick question: any downsides to rooting? I know there's tons for doing a ROM, but any for rooting? Whats the chance that I'm going to mess up my phone? Might void the warranty. So make sure you know of a way to un-root it incase you need to send in your phone for servicing. Should be easy though. Might? Definitely voids the warranty. And if you flash a new ROM it'll trip the "flash counter"
Are they worse than the audible pop-up ads you merely need to mouse over to activate that plague this site? Only BARELY. lmao!! yea thats soo freaken true!! yea only BARELY! There is a lot of outrage against ads that use the notification bar. One developer had a game that started doing that. There was such a backlash that the developer took it off. The problem I have with notification bar ads is that the ads pop up no matter how much or how little you use the app. I'm OK with ads appearing when I play the game or use the app. However, I am not OK with ads appearing every day for an app I haven't used in over a month. Another issue with these ads is that you don't know which app is causing the ads. When you install an app, the ads usually don't appear until later that day or perhaps a day or two later. If you installed a bunch of apps, you won't know which app causes it. Users of T-Mobile should complain as much as possible. No one I know of is OK with ads randomly popping up in the notification bar. 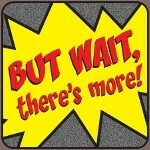 I hate the adds on here that pop up when i load the page & don't always disappear when I try 2 close them. Instead taking me to some bullsht add. I'm so freaking tired of this never ending attempt to sneak advertising into every possible nook and cranny of our lives!!! What is next,a pop out window out of the toilet when I'm going number 2??? Or toilet paper with ads on it??? Then they ask why people are urged to root their devices and change carrier firmware. Has anyone actually ever bought something from a phone ad? Very unlikely. People probably don't even click on them, much less buy something. Waste of space if you ask me. I don't get it. Via the links provided, TMob said it was a mistake, and that the app didn't honor the preferences to not have those notification ads, and that they fixed it. "I'm sorry to hear about your recent experience with the T-Mobile marketing promotion ads that appeared on your phone. Feedback received from our customers has assisted us with disabling those ads from the notification bar on Android phones. These notifications appeared due to an error in our systems and will not appear in the future. If you had previously signed up to not receive marketing promotions from T-Mobile and these ads still appeared, it was because the error bypassed your notification preference. This system error has been addressed and the notification preference option is still active on your account. We sincerely apologize for this inconvenience and will ensure it does not happen in the future." I find it hard to believe that those ads are due to an error in their systems. It's more like an error in judgement when someone decide to put ads in the notification bar. To say that it was an error in their system is just an insult.